Now we aren’t saying that you can just throw a video on your website and get twice as many sales, but we do know that the stat above is just one of many that prove the need for video in your marketing and sales efforts. Research over the past few years has proven that people are watching more video and, more importantly, that video has a substantial effect on people’s behavior. Adding video has been proven to increase email open rates, decrease bounce rates, positively affect conversion and close rates, and much more. Why? Because today’s buyer is very different from the buyers of yesterday. People buying your products or services today are more empowered and picky than ever before. They’re used to getting information at a moment’s notice and they’re far more likely to trust Google than a salesperson. If you work in sales or marketing, this fact probably isn’t news to you. We’ve seen it affect everything from the decline of shopping malls to the rise of online companies like Yelp and Amazon. As buyers have transitioned from getting their information online rather than from direct conversations, two big things have happened that opened the door for video marketing. First, people now want to get all the information they need as quickly and easily as possible. For many, reading a bunch of information about a product doesn’t seem nearly as quick or easy as watching a short video. Second, buyers are craving authenticity. In a world of text-based communication and well-designed websites, everything can start to seem a little too distant or even fake. By adding in some video, you bring back the human element. People can connect a person to the message, see body language, and hear changes in voice tone. This is much more likely to help you create a connection with your potential buyer than just text. Okay, now we know why video helps us get those improvements in performance that the research shows. But how should you actually add video to your funnel. In transactional sales, buyers go through those stages very quickly. But in longer sales cycles, it usually takes some work to get people from one stage in the funnel to the next. Just as we use different messages and tactics for people at different stages of the funnel, we also need to deliver different types of videos at each stage. 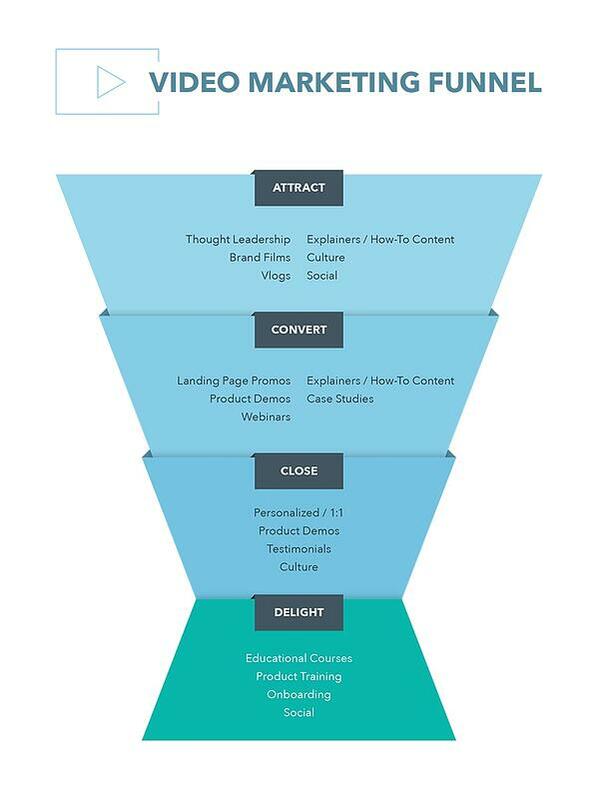 This graphic shows how you can use full-funnel video marketing to drive more sales. We break it down in more detail below. The attract stage is where buyers first hear about your company. Marketing and sales tactics designed to do things like spread brand awareness or drive website traffic fall in this stage of the funnel. Some specific sales activities at this stage include cold calling, cold email, referral programs, attending trade shows and other events, etc. At the convert stage, we’re focused on turning people into leads. This includes everything from qualifying a prospect on a cold call to converting a website visitor into a lead through a landing page form. This stage is also where we nurture leads towards the sale, especially if you have a long sales cycle. The close stage is the one that typically gets salespeople the most excited. This is where we finally turn a lead into a customer and get paid! Because this stage is usually where the marketing department is least involved, it’s often the stage where video is used least often. But it’s also the stage where video can be most effective. We all know that people buy from people they know, like, and trust, but it’s really hard to create that kind of relationship over the phone or through email. The delight stage is the one that gets neglected most often, but it can have an incredible impact on your sales performance over time. It’s simple, delighted customers make repeat purchases and drive referral business. Disappointed customers stop buying from you and damage your brand’s reputation through things like negative reviews and unflattering conversations with potential customers. The reason this sales funnel stage gets neglected most often is also simple. We’re all busy and we tend to focus our time on closing new deals. And that’s exactly why video is perfect for the delight stage. It allows you to stay in front of all your current customers without having to devote personalized attention to each of them for every conversation. We have quite a few articles that dig into specific parts of video production if you’re ready to dive in head first. But, if you’re just getting started, most of these videos can be created with just a smartphone and some good lighting. If you’re a salesperson doing this yourself, our article on cheap video production equipment will give you a good overview of some entry-level video equipment. But if you’re in a company with separate marketing and sales departments, we recommend getting those departments to work together on these videos. The sales people should really be on camera to create that authentic connection with their prospects but the marketing department can help guide the message and they can repurpose the videos throughout the marketing strategy. John Barrows, who specializes in sales training, says that sales reps who leave voicemails should have no issues creating video. To see some examples of the types of videos you’ll need to create, check out our article: 8 Essential Types of Video for Business. The way people buy has changed – they want to do their own research and they’re not as trusting as they used to be. But video can help you break through and connect with them, and the research proves it. Add the right types of video throughout your sales funnel and you’ll be able to close more deals with less one-on-one time. It’s a win-win!